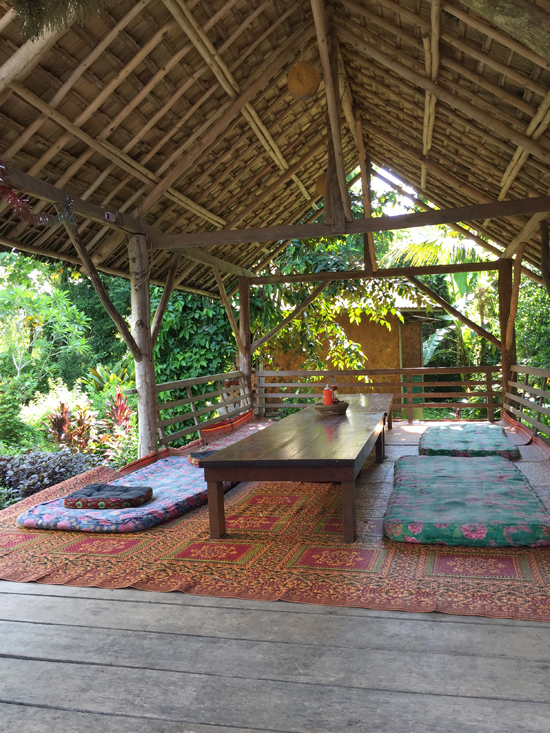 Maylyn Guesthouse feels like a secret garden for backpackers. It has the typical chilled out, friendly and welcoming vibe backpackers love but does not sacrifice on cleanliness and comforts. 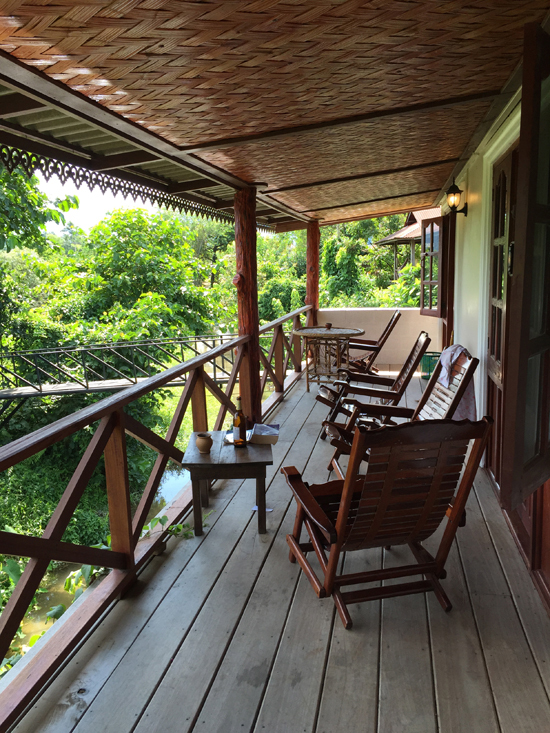 Though not far at all from town (it’s just across the river close to the toll bridge), you feel close to nature and the place has plenty of nooks – hammocks, balconies, lounge sala – to enjoy the peace, quiet and views. 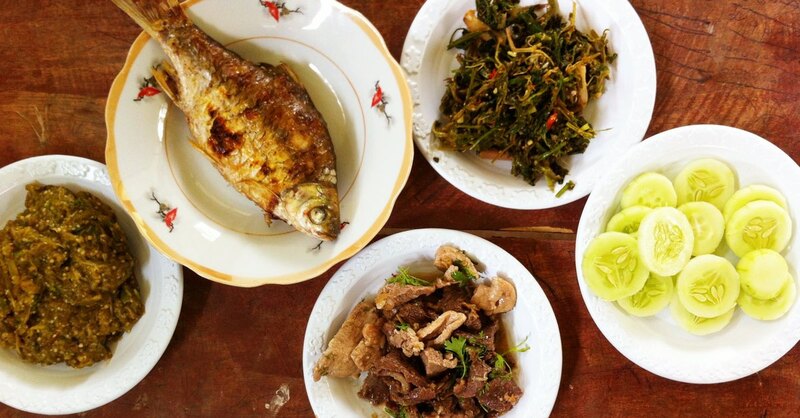 The accommodation is a hodgepodge and that means there is something for everyone. 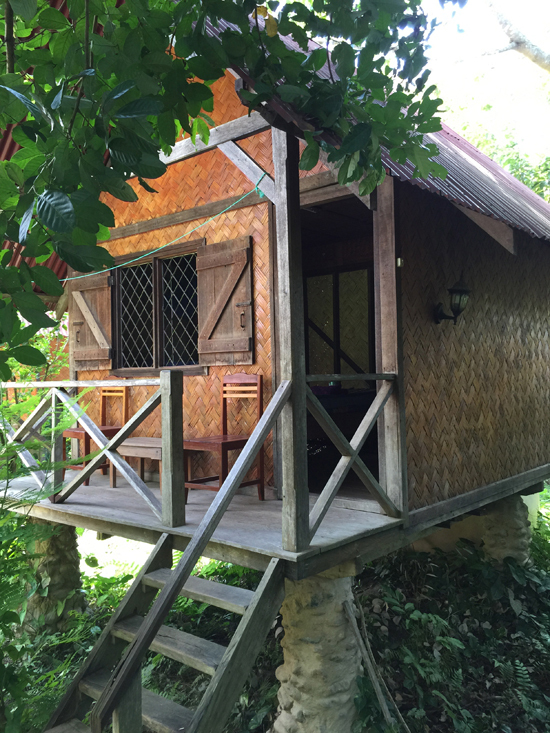 Those who love bungalows can choose a typical rustic place with bamboo thatch. We’ve experienced a lot of cheap bungalows in our lifetime and these ones are probably better built and maintained than all the rest. 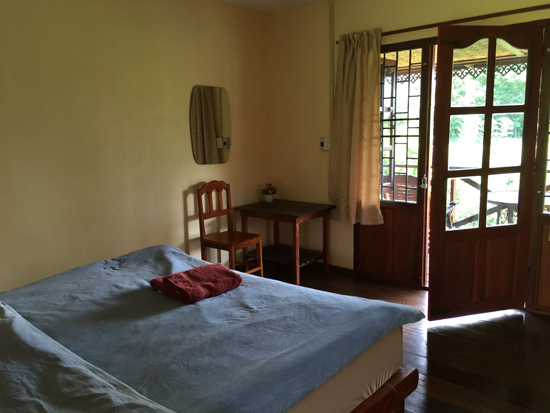 There’s clean wood floors, a front balcony, indoor and outdoor lighting, comfortable bed with decent linens and mosquito net. There’s not a speck of dust on the floor, not a cobweb on the wall. Safety bars on the windows mean you won’t lose sleep at night about keeping the windows open. 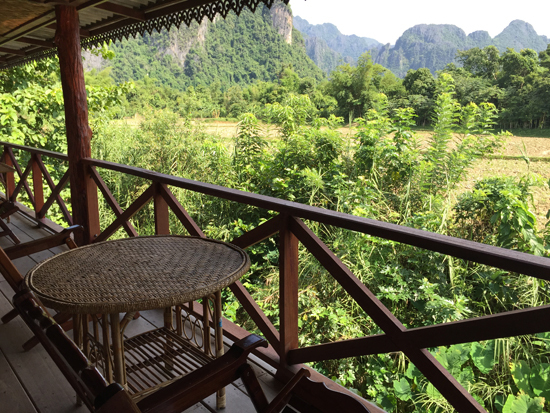 The bigger bungalow has several rooms and one large shared balcony with hammock and comfortable chairs to relax and enjoy the stunning view of the rice paddies and the karst. These rooms are larger, with solid wood floorboards and attached bathroom with western toilet, sink, mirror and cold shower. The only drawback would be if you have noisy neighbours. The new bricks and mortar rooms have no direct views but they are a fantastic deal. Rooms range from basic with shared bathroom to doubles and a triple which would be great for a family. Compared to so many modern concrete and tile guesthouses in town, care has been taken in the details to add some warmth, charm and character with bits of furniture, tasteful curtains and art. The shared hot water bathroom is the cleanest we have seen in Laos. There’s a great little restaurant with WiFi attached to the property so you don’t have to trek into town every night. Breakfast is not included. The owners of Maylyn are lovely and they really make this place a cut above the rest. The guesthouse has been around since 2002 and Joe remains amiably eccentric, his dry humour intact even after all these years. Our only criticism (and we’re nitpicking) is that the lush garden is a little too lush. The overgrown pathways can be difficult to navigate but given the size of the greenery and grounds, we can imagine it would take constant effort to cut it back. So for those who love the relaxation and nature, this is a sensational choice.